Heat oil in 10-inch nonstick skillet over medium-high heat. Cook chicken in oil 8 to 10 minutes, turning once, until juice is no longer pink when centers of thickest pieces are cut. Remove chicken from skillet; keep warm. Add water to skillet; heat to boiling. Stir in rice and stir-fry sauce; remove from heat. Cover and let stand 5 minutes. While rice is standing, cook vegetables as directed on bag. 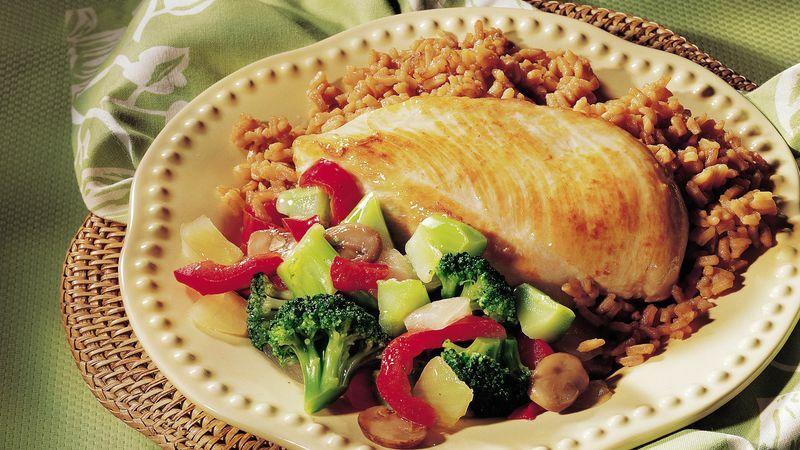 Serve chicken over rice with vegetables on the side. Dress up this meal with wedges of ripe honeydew melon and cantaloupe, and serve ice cream and fortune cookies for dessert. Pump up the flavor by cooking rice in 1 3/4 cups chicken broth instead of water and adding 1/2 teaspoon of Chinese five-spice powder to the stir-fry sauce.